If you entered the back of the Giant Center Sunday night, then listened and squinted toward the stage, you might have thought you'd been transported back to the 1960s. There's diminutive music icon Paul Simon, singing in harmony with a tall guy. But that taller guy is playing the bass. And his name is Sting. 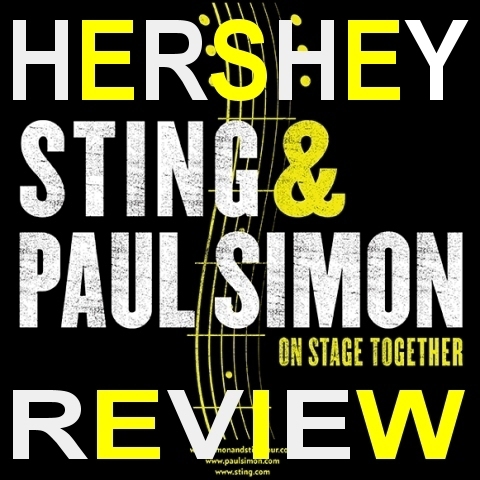 The two musical icons performed mostly separately, and momentarily together, during the Hershey stop on their minimalistically named the "On Stage Together" tour before a large and appreciative crowd. In that crowd, hands swayed, fannies shook and couples snuggled, ensconced in nostalgia that spanned two famous singer-songwriters' oeuvres from the '70s through the early years of the new millennium. The two men, both dressed in T-shirts with matching black jackets and pants, opened the evening with a rollicking rendition of Sting's "Brand New Day," taking turns delivering a couple of lines and occasionally singing in harmony - as they did with the handful of numbers they performed together during the night. The two men spoke sparingly on stage. Their two-plus-hour concert, instead, focused on the varied types of songs each man has produced over their respective long careers. 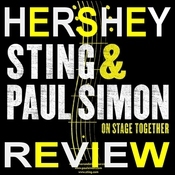 Both men have created songs that are joyful and tunes that are profound, and each explored both musical worlds at Hershey. "Welcome to our musical merging of styles and bands," Simon told the crowd early in the concert. "This is something of an experiment … that's turned out to be fun and interesting." Each musical icon took his turn, solo on the stage, delivering several of his best-known numbers and giving the crowd plenty of chances to sing along to familiar lyrics. Despite singing from beneath receding hairlines, both men demonstrated they're still in fine voice. At 62, Sting, brought to the musical table a vocal instrument still strong and supple, and able to hit those high notes on hits such as the Middle Eastern-flavored "Desert Rose" and the rocking "Message in a Bottle." The former Police frontman threw back his head and barked "Roxaaaaanne." He literally barked - and howled - on the mournful "Hounds of Winter." He crooned through the romantic "Fields of Gold" and delivered a spirited "Englishman in New York." One of the more poignant moments of the night came as Sting paid tribute to Simon as "one of my mentors and teachers for many years," and launched, solo, into a lyrical rendition of Simon's "America." Sting said the tune reminded him of a watershed moment in his life: his first trip to the United States with The Police when he was in his 20s - staying in fleabag hotels and playing in tiny venues while experiencing "that sense of wonder" of their early years as a band. Simon, at 72, a decade older than his stage compatriot, delighted the crowd with such favorites as a thrumming "Graceland," thoughtful renditions of "Still Crazy After All These Years" and "Hearts and Bones" and a bouncy delivery of "Me and Julio Down by the Schoolyard," "Mother and Child Reunion" and "Boy in a Bubble." Simon's phrasing was thoughtful and creative. While he occasionally showcased his acoustic guitar virtuosity, he mostly stood still at the mic, singing and employing a range of gestures - shaking his finger, waving his hands sinuously, doing a little dance, playing air piano and patting himself on the chest. Sting and Simon came together in harmony for the Simon & Garfunel classic "The Boxer," accompanied, of course, by the entire audience on the "lie-la-lie's." The backing band of about 11 musicians and one female backup singer was strong and versatile. The musicians deftly handled multiple instruments - fiddle, guitar, percussion, horns, reeds, accordion, mandolin - that conjured the orchestrations on both singers' most familiar recordings of their songs. 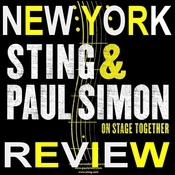 Simon and Sting's short tour will end in about a week. If the two men's collaboration is an experiment, it's one that should be allowed to continue to percolate in the musical laboratory, and evolve organically in front of audiences, for many years to come. For more reviews from the Hershey show please visit http://www.sting.com/tour/date/id/2918 where you can view the setlist, leave your comments about the show, post images of your ticket stub and your photos from the show!